Looking to surprise someone with a welcome home party? 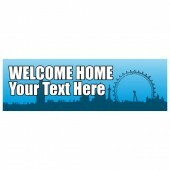 Discount Banners offers a great range of pre-designed Welcome Home Banners that can be personalised to suit your needs. Regardless of age or occasion we have a Welcome Home Banner for you. Our Welcome Home Banners are printed on high quality PVC using eco-friendly inks so that you get a stunning full colour banner with the environment in mind. 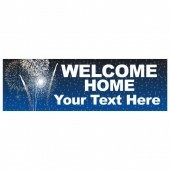 Welcome Home Banners are available in 8’x2’ or 10’x3’ depending on your requirements and should be received 2-5 days after your order has been placed.